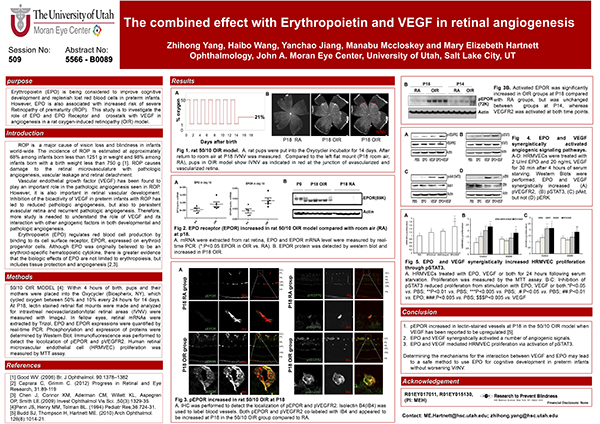 This abstract was presented today at the Association for Research in Vision and Opthalmology (ARVO) meetings in Seattle, Washington by Zhihong Yang, Haibo Wang, Yanchao Jiang, Manabu Mccloskey and ME Hartnett. Purpose: Erythropoietin (EPO) is being considered to improve cognitive development and replenish lost red blood cells in preterm infants. However, EPO is also associated with increased risk of severe Retinopathy of prematurity (ROP). This study is to investigate the role of EPO and EPO Receptor and crosstalk with VEGF in angiogenesis in a rat oxygen-induced retinopathy (OIR) model. Introduction: ROP is a major cause of vision loss and blindness in infants world-wide. The incidence of ROP is estimated at approximately 68% among infants born less than 1251 g in weight and 98% among infants born with a birth weight less than 750 g . ROP causes damage to the retinal microvasculature with pathologic angiogenesis, vascular leakage and retinal detachment. Vascular endothelial growth factor (VEGF) has been found to play an important role in the pathologic angiogenesis seen in ROP. However, it is also important in retinal vascular development. Inhibition of the bioactivity of VEGF in preterm infants with ROP has led to reduced pathologic angiogenesis, but also to persistent avascular retina and recurrent pathologic angiogenesis. Therefore, more study is needed to understand the role of VEGF and its interaction with other angiogenic factors in both developmental and pathologic angiogenesis. Erythropoietin (EPO) regulates red blood cell production by binding to its cell surface receptor, EPOR, expressed on erythroid progenitor cells. Although EPO was originally believed to be an erythroid-specific hematopoietic cytokine, there is greater evidence that the biologic effects of EPO are not limited to erythropoiesis, but includes tissue protection and angiogenesis. Methods: 50/10 OIR MODEL: Within 4 hours of birth, pups and their mothers were placed into the Oxycycler (Biospherix, NY), which cycled oxygen between 50% and 10% every 24 hours for 14 days. At P18, lectin stained retinal flat mounts were made and analyzed for intravitreal neovasclarization/total retinal areas (IVNV) were measured with ImageJ. In fellow eyes, retinal mRNAs were extracted by Trizol, EPO and EPOR expressions were quantified by real-time PCR. Phosphorylation and expression of proteins were determined by Western Blot. Immunofluorescence was performed to detect the locolization of pEPOR and pVEGFR2. Human retinal microvascular endothelial cell (HRMVEC) proliferation was measured by MTT assay. 1. pEPOR increased in lectin-stained vessels at P18 in the 50/10 OIR model when VEGF has been reported to be upregulated..
2. EPO and VEGF synergistically activated a number of angiogenic signals. 3. EPO and VEGF mediated HRMVEC proliferation via activation of pSTAT3. Determining the mechanisms for the interaction between VEGF and EPO may lead to a safe method to use EPO for cognitive development in preterm infants without worsening VitNV.